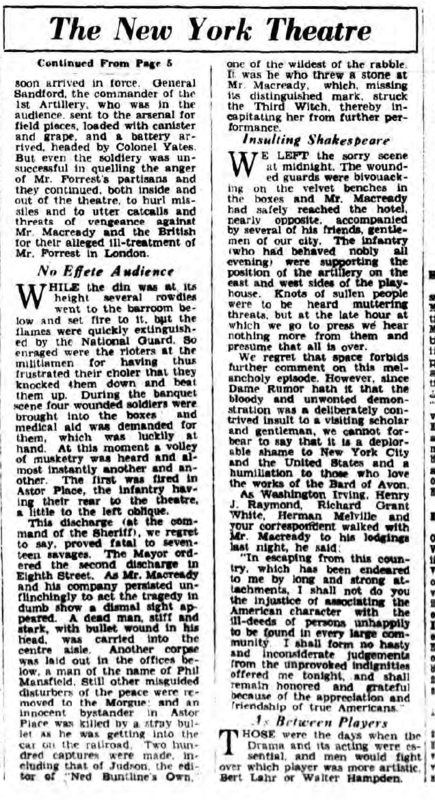 Commemorating the 84th anniversary of the Astor Place riot, drama critic Percy Hammond resurrected an old newspaper report by "an ancient friend of mine" who described the disrupted performance of Macbeth by W. C. Macready of Monday, May 7, 1849 and ensuing violence in and out of the Opera House. We regret that space forbids further comment on this melancholy episode. However, since Dame Rumor hath it that the bloody and unwonted demonstration was a deliberately contrived insult to a visiting scholar and gentleman, we cannot forbear to say that it is a deplorable shame to New York City and the United States and a humiliation to those who love the works of the Bard of Avon. Hammond makes, a-hem, full use of his journalistic license. What the drama critic presents in May 1933 as a continuous narrative from May 1849 actually has been cobbled from at least two different accounts of different days. 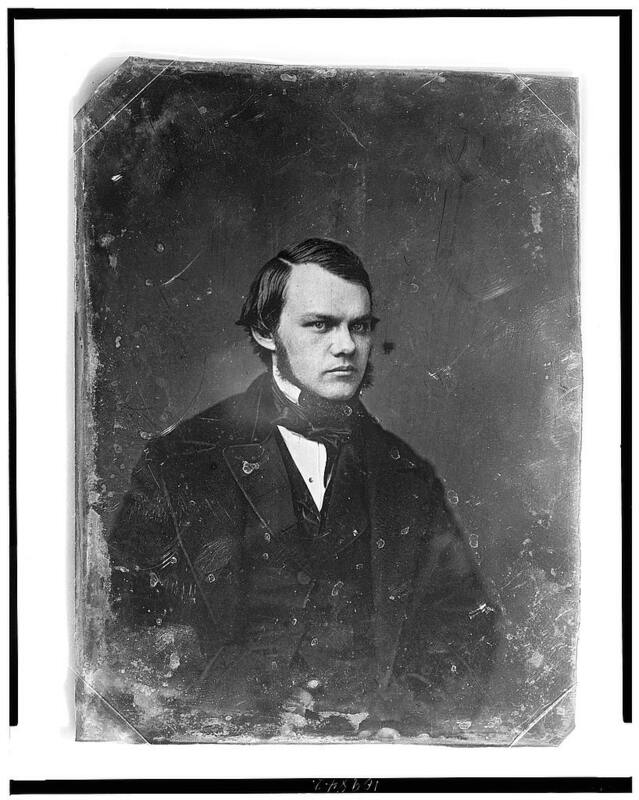 The single misleadingly continuous report of Hammond's "ancient" newspaper friend conflates newspaper accounts of Macready's performance on Monday, May 7, 1849 and the ill-fated return engagement on Thursday, May 10, 1849. Moreover, the second part of the story, dealing with the extreme violence of the actual riot and deadly military response on Thursday night, May 10th, confusingly ends with a mangled version of Macready's written and published reply to the public letter of support that we already knew about, the famous one signed by Melville and many others, including Melville's best mates around then, Evert Duyckinck and Cornelius Mathews. Great Riot at the Astor Place!—Mr. Macready driven from the stage by an organized mob! The tragedy of “Macbeth” was put up for representation at three theatres, in this city, last night. 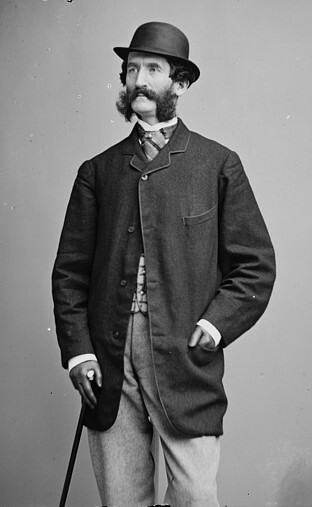 Mr. Forrest played it to a thin house, at the Broadway, and Mr. Hamblin to a full one, at the Bowery, where Mr. Ryder was the “Macduff,” and had a tremendous reception, on his first appearing, great applause throughout, and an enthusiastic cheering, on being called before the curtain to make his acknowledgments. He plays “Iago” there to-night, to Mr. Hamblin’s “Othello.” Mrs. Shaw is playing the engagement there with them. Then arose louder yells, and these were accompanied with showers of rotten eggs, apples, and a bottle of asafoetida, which diffused a most repulsive stench throughout the house. Mr. Macready endured all this without flinching, for some time; and, at length, commenced his part, which he went on with, in dumb show, through two acts, and a part of the third. But, as the play proceeded, the fury of excitement seemed to increase; until the mob began to shout to the “Lady Macbeth” of the evening to quit the stage; and on Mr. Macready’s next appearance a heavy piece of wood was flung from the upper tier, and a knot of men, in the parquette, near the orchestra, then showed themselves as a part of the rioters, and, to the end, joined in all the demonstrations of disorder. When, in the third act, “Macbeth” comes on, as “King,” the uproar was at its height. Atr this stage of the proceedings, four chairs were thrown in rapid succession, at the stage, from the easterly corner of the upper tier. One fell into the orchestra, and the others on the stage. The last fell directly across Mr. Macready’s feet. The curtain then fell, and there was a long intermission. During this, several gentlemen undertook to remonstrate with the rioters, but without avail. Mr. Chippendale then came forward, but could not obtain a hearing. He then advanced, with Mr. Sefton, bearing a placard, on which was written, “Mr. Macready has left the theatre.”—Meantime, another placard had been displayed by the mob, on which was inscribed, “No apologies! It is too late!” Mr. Clarke was then called for, came forward, expressed his thanks for his reception, and said he had accepted this engagement as his only present means of supporting himself and family by his professional exertions. This over, the rioters slowly left the house. We learn that some of them were arrested, on getting into the street. The police were present in considerable force, but did nothing that we could see, in the house, towards quelling this disgraceful riot. We have not undertaken to do more, in this hasty article, than to give the leading transactions of the night. We might give a long list of the different cries which were uttered on the occasion, as going to show the spirit and motives by which the mob were actuated. 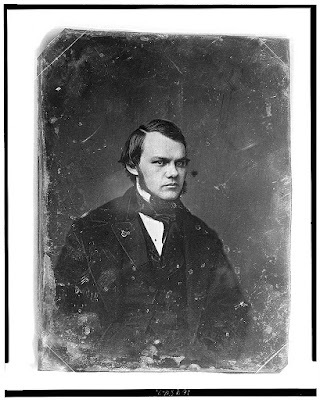 Such as “Three groans for the English bull dog!” “Nine cheers for Edwin Forrest!” “Remember how Forrest was treated in England!” “Huzza for native talent!”—“Down with the codfish aristocracy!” and the like. But we have, at this late hour, neither the requisite time nor space. We can only say that the whole scene was deeply disgraceful to our city and country, and that it is truly melancholy to reflect that there was neither moral nor physical force enough at hand upon the occasion to prevent or put it down. --Trenton [New Jersey] State Gazette (May 9, 1849); found in the online historical newspaper archives at Genealogy Bank. The second and for Melville fans even more tantalizing part of Hammond's "reprinted" narrative seems to be similarly indebted to a contemporary newspaper report. Possibly Hammond had before him a later report in the same New York Express or Evening Express, dated say Friday, May 11, 1849--the day after the bigger and more deadly riot on Thursday night. The police were seemingly indifferent to these violences, and so the militia was summoned, and soon arrived in force. General Sandford, the commander of the 1st Artillery, who was in the audience, sent to the arsenal for field pieces, loaded with canister and grape, and a battery arrived, headed by Colonel Yates. But even the soldiery was unsuccessful in quelling the anger of Mr. Forrest’s partisans and they continued, both inside and out of the theatre, to hurl missiles and to utter catcalls and threats of vengeance against Mr. Macready and the British for their alleged ill-treatment of Mr. Forrest in London. While the din was at its height several rowdies went to the barroom below and set fire to it, but the flames were quickly extinguished by the National Guard. So enraged were the rioters at the militiamen for having thus frustrated their choler that they knocked them down and beat them up. During the banquet scene four wounded soldiers were brought into the boxes and medical aid was demanded for them, which was luckily at hand. 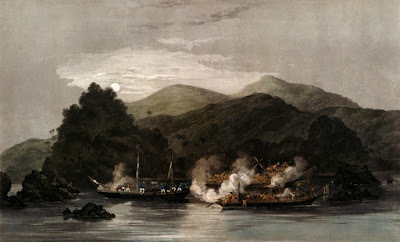 At this moment a volley of musketry was heard and almost instantly another and another. 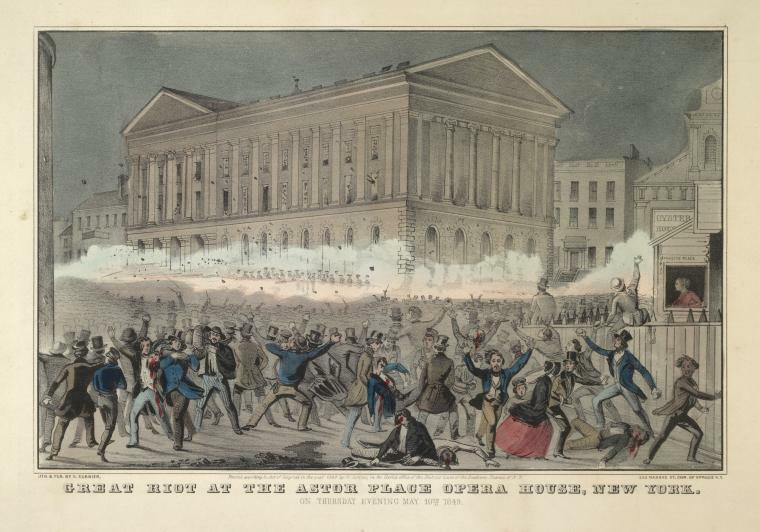 The first was fired in Astor Place, the infantry having their rear to the theatre, a little to the left oblique. This discharge (at the command of the Sheriff), we regret to say, proved fatal to seventeen savages. The Mayor ordered the second discharge in Eighth Street. As Mr. Macready and his company persisted unflinchingly to act the tragedy in dumb show a dismal sight appeared. A dead man, stiff and stark, with a bullet wound in his head, was carried into the centre aisle. Another corpse was laid out in the offices below, a man of the name of Phil Mansfield. Still other misguided disturbers of the peace were removed to the Morgue and an innocent bystander was killed by a stray bullet has he was getting into the car on the railroad. 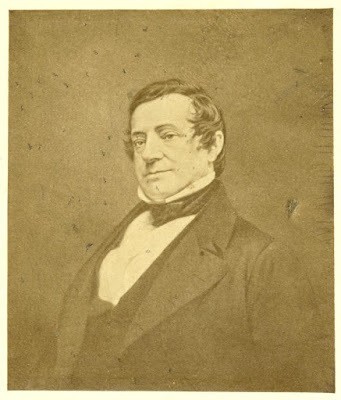 Two hundred captures were made, including that of Judson, the editor of “Ned Buntline’s Own,” one of the wildest of the rabble. It was he who threw a stone at Mr. Macready, which, missing its distinguished mark, struck the Third Witch, thereby incapitating her from further performance. We left the sorry scene at midnight. The wounded guards were bivouacking on the velvet benches in the boxes and Mr. Macready had safely reached the hotel, nearly opposite, accompanied by several of his friends, gentlemen of our city. The infantry (who had behaved nobly all evening) were supporting the position of the artillery on the east and west sides of the playhouse. Knots of sullen people were to be heard muttering threats, but at the late hour at which we go to press we hear nothing more from them and presume that all is over. “In escaping from this country, which has been endeared to me by long and strong attachments, I shall not do you the injustice of associating the American character with the ill-deeds of persons unhappily to be found in every large community. I shall form no hasty and inconsiderate judgements from the unprovoked indignities offered me tonight, and shall remain honored and grateful because of the appreciation and friendship of true Americans.” --Philadelphia Inquirer, May 7, 1933; found at Fulton History. Even if the "ancient friend" is imaginary, Percy Hammond in 1933 did not make all this stuff up. Most of it he got verbatim from contemporary newspaper reports, starting with the New York Evening Express. I would guess much of the rest likewise came from James Brooks's New York Express in some format or other (Morning, Evening, Weekly, Semi-Weekly). Surviving runs of the Express are sadly incomplete. Working hypothesis: possibly the limited availability or loss of the New York Express for May 11, 1849 resulted in our losing a unique sighting of Herman Melville physically (not only on paper) in the company of Washington Irving, Henry J. Raymond, Richard Grant White--and let's not forget Hammond's old "friend," some young (in 1849) and still anonymous New York Express reporter. Hmmm. Maybe we can at least find out who worked the Shakespeare beat for the New York Express in May 1849. The Norwich [Connecticut] Evening Courier of May 12, 1849 has the subsequent report we were looking for from the New York Express which (as predicted) is definitely the main source for the second part of Hammond's narrative. However, no reference to "your correspondent" or his companions appears in the Evening Courier version--either the Norwich editor cut that portion from the original Express article, or we lack a third source for the narrative of Hammond's "ancient friend."